The Nikon D5000 digital SLR incorporates numerous pro-quality imaging technologies normally found in pricier Nikon DSLRs in a smaller, less-expensive Nikon DX-format camera body. Key among these features are the same 12.9 megapixel CMOS sensor found in the Nikon D90, High-Definition video capture (with sound), a 2.7" variable-angle LCD, Live View for composing stills or video from most any point-of-view, an 11-point autofocus system with Focus Tracking, and 3D Color Matrix II metering. Other advanced Nikon features found in the D5000 include the ability to shoot in RAW, 3 levels of JPEG compression, or RAW+JPEG image capture, burst-rates up to 4 fps, an EXPEED image processor, and a 3-tier dust-removal system. AVI-format video clips can be captured at 3 levels of compression in lengths up to 20 minutes with the ability to apply exposure compensation when shooting in Program, Shutter-priority, Aperture-priority, and Manual modes. Depending on your needs, exposure information along with a grid screen for image composition can be displayed on the camera's multi-position LCD when shooting in Live View mode. 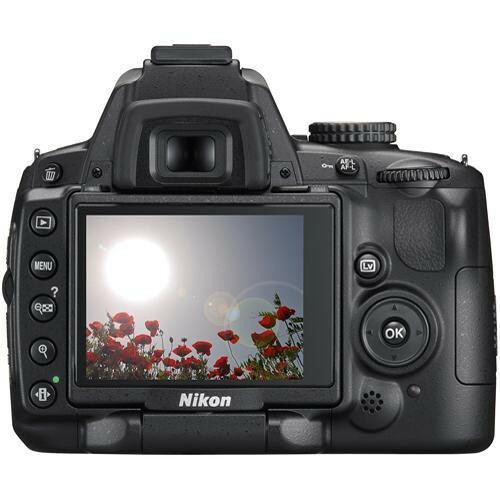 The Nikon D5000 is optimized for use with all AF-S and AF-I NIKKOR lenses and works with select functionality when used with Nikon Type G, D, AI-P, and non-CPU-series optics. Included in this kit is the Nikon 18-55mm f/3.5-5.6G VR AF-S DX Lens, which is an ultra compact, lightweight standard zoom lens that has a 3x focal zoom range and is ideally suited for use with compact Nikon digital SLR cameras that feature the smaller DX sized chip. This lens offers the most basic zoom range in the DX lens series, an equivalent focal length in 35mm terms of 27-82.5mm. 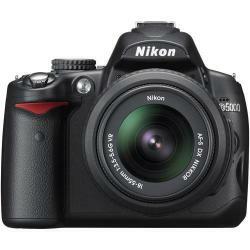 It will conveniently cover everything from tight indoor portraits to standard snap shots.